Are you a thrillseeker? Do you want to bungee jump off the world's tallest glass-bottomed suspension bridge? Then visit the Zhangjiajie Grand Canyon Glass Bridge. The Zhangjiajie Grand Canyon Glass Bridge, which opened in 2016, stretches 430 meters over a 300-meter-deep valley between two cliffs in the Zhangjiajie Grand Canyon. Designed by Israeli architect Haim Dotan, the glass-bottomed bridge has received 5.9 million visitors since it was open in 2016. 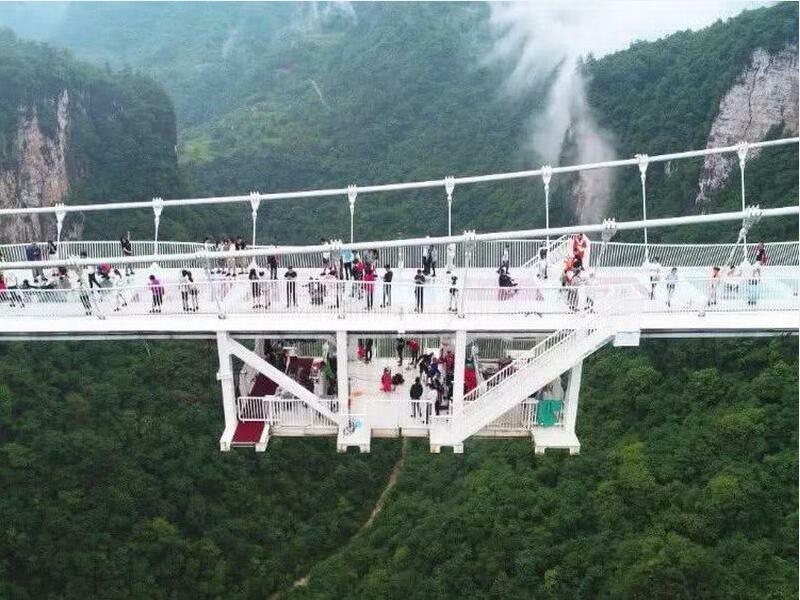 A 265-meter-high bungee-jump platform was added to the Zhangjiajie Grand Canyon Glass Bridge in August 2018. It marks the highest commercial bungee jumping platform in the world. 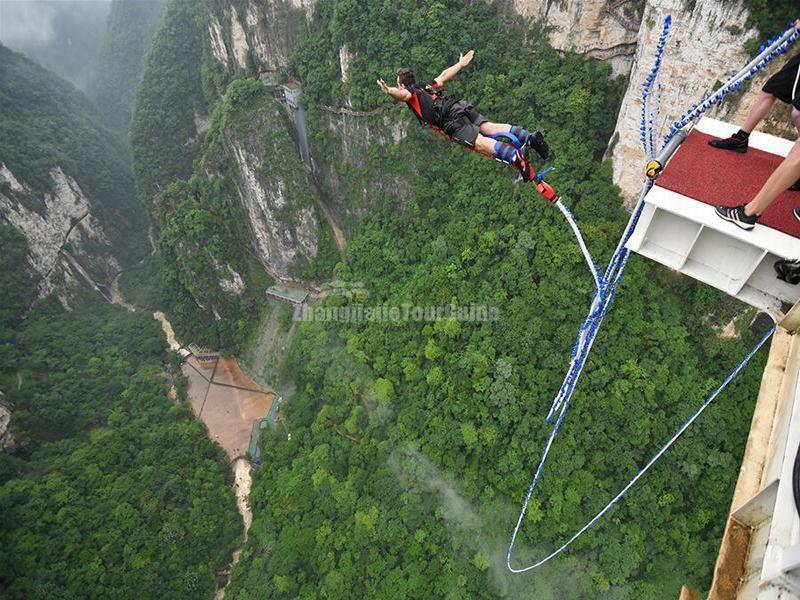 The jump offer some really good views of the unusual landscape of Zhangjiajie. Visitors on the glass bridge can just look down and see someone bungee jumping. A bungee-themed bar and restaurant at the end of the bridge allow the fainthearted to participate by ordering bungee-themed drinks and watch daredevils leap off the bridge. The platform was expected to open to the public in early August, 2018, but the adventurous bunch have not been tested out the platform by now. The opening date of the platform is uncertain. If you wish to take the plunge, just pay attention to news from the Zhangjiajie Grand Canyon park or Zhangjiajie Tour Guide. 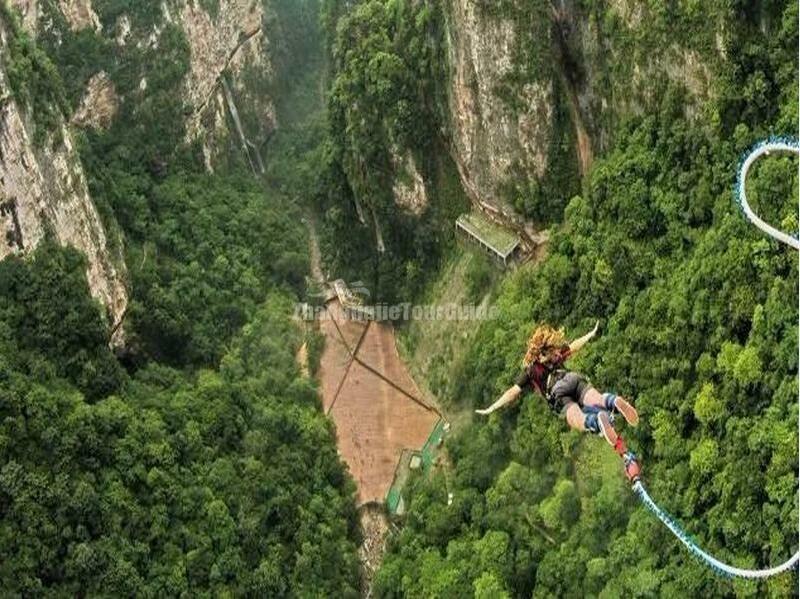 On May 26, 2018, Zhangjiajie Grand Canyon Glass Bridge hosted a Bungee Jump Challenge to promote the attraction.The above photos were from the pre-opening bungee-jump challenge.